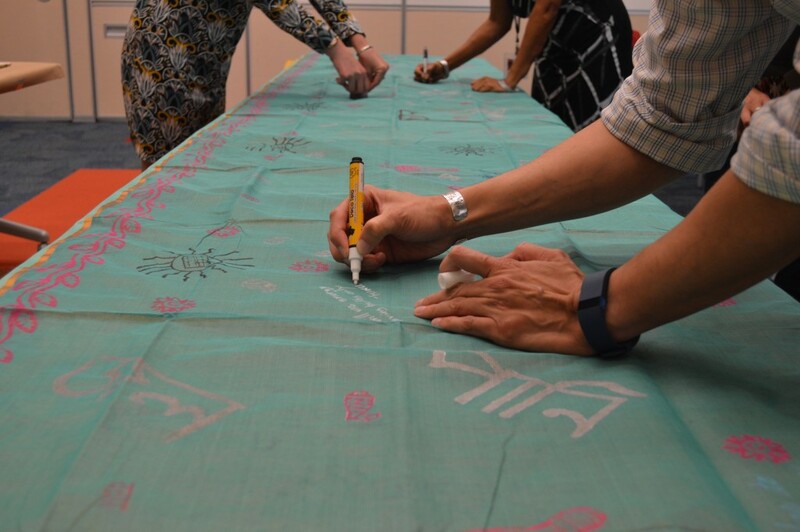 Six yards of aqua green handloom cotton sari, handprinted with a hot pink woodblock vine border and the Bengali word for Water repeated to create a border in silver on the other edge. The words for water “Pani” and “Jal” repeated in woodblock across the body of the saris. 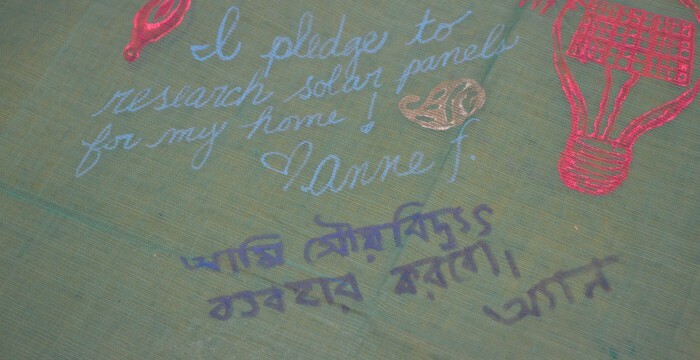 Handwritten script in multi-colors promising to take specific steps to reduce carbon footprint, such as “I will walk to locations close to my house instead of driving,” “I plan to research solar panels for my home” and “I will use a programmable thermostat.” All these were translated into Bengali so that the people of Bangladesh will understand the pledges. On May 31, 2016, right after the Memorial Day Weekend, I spent the day in Richmond, Virginia to do a talk and climate pledge workshop at the Capital One Campus, where I also have a six week-long exhibition called “Water” in the Capital One Gallery. I was introduced to Capital One by artist and curator Naoko Wowsugi, who has a long relationship with the arts in Richmond and regularly curates shows for Capital One for Asian Pacific Heritage Month. It was so interesting to visit this corporate campus, which is like a college, with multiple buildings, lecture halls, a health center and a cafeteria. Capital One is headquartered in Virginia with a massive “campus” in Richmond. It is one of the largest employers in Richmond with approximately 10,000 employees. I was impressed to see that they have a shared bicycle program on campus for the employees as well as a robust recycling program. Most amazing is the Capital One Art Program, boasting a huge permanent art collection that rotates around the Capital One office buildings as well as 90 exhibitions a year in their various facilities. As part of the workshop, the participants learned about the major contributors to green house gases in the United States and ways in which we can take steps to reduce our carbon footprint. I also discussed the recent climate accord reached at COP21 in Paris, where 196 nations agreed to cap global temperature rise to no more than 2 degrees celsius higher than preindustrial levels. I shared the stories of the women of Katakhali Village and the recent climate knowledge sharing workshop and collaborative performances that I initiated there. 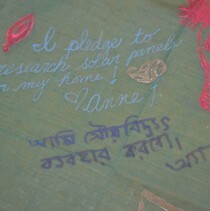 We all made concrete pledges to reduce our individual carbon footprint and painted the pledges on an aquamarine cotton sari, which my mother just brought for me from Bangladesh. 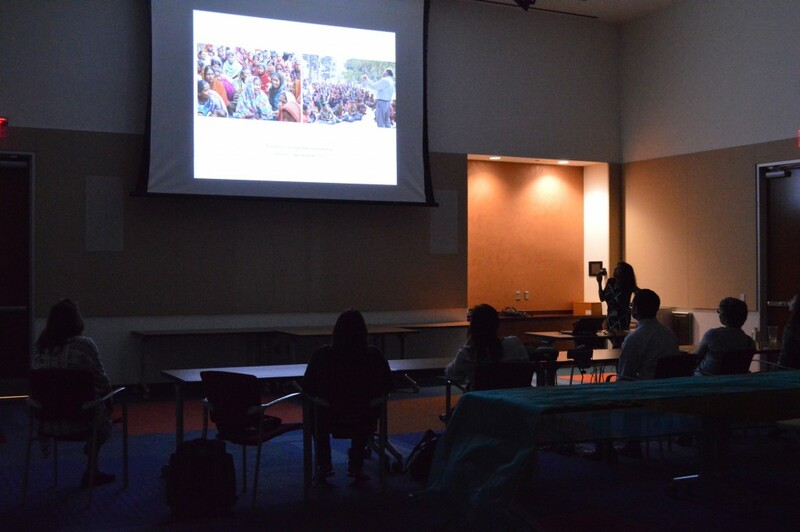 One of the participants was from South India and very interested in hand loom cotton saris and wood block-printing. Interestingly, I noticed many South Asian employees on the Capital One campus. I was truly honored to be invited to do a workshop at Capital One. I am always interested in reaching new communities outside a traditional gallery setting. 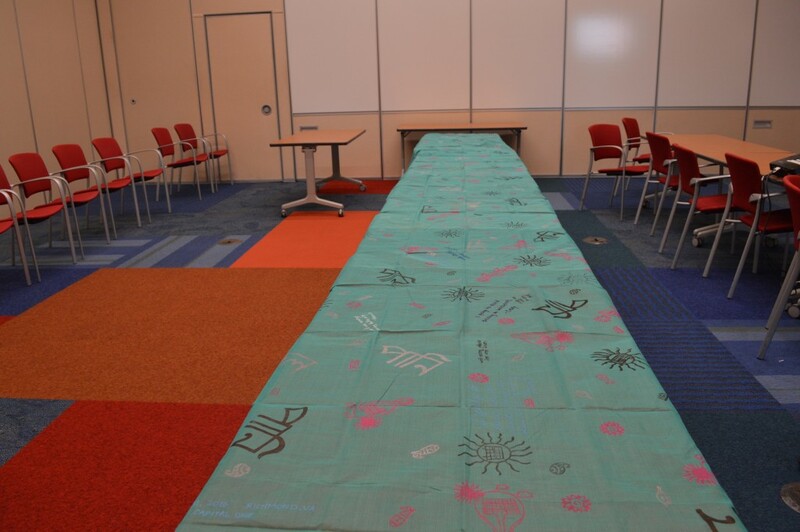 I am super pleased that the entire sari was completed during the workshop thanks to the hard work of the team. Once we finish 12 climate pledge saris, they will be taken back to Bangladesh and given to women in Katakhali Village to wear as garments. For the now the “Water” sari made at Capital One will be added to the installation which will be on view through the end of June. Photo credit: Naoko Wowsugi. All images and text copyright 2016 Monica Jahan Bose.